Perhaps a bit of background is in order. In the Battlestar Galactica universe, humans are scattered across twelve planets (well, until the Cylons decide to exterminate the human race, but that’s not important for this topic…). Presumably, it’d be extremely unlikely for these planets to have exactly same rotation rates and orbital parameters. In other words, each planet would have a different length of day and year, just like the planets in our own solar system. On Earth, we deal with differing times to some extent: while the Sun shines on one side of the Earth, the other side experiences the darkness of night. As most people know, we’ve handled this by slicing the surface of Earth into a series of time zones. For people communicating across different time zones, the problem is resolved either by agreeing on a single time standard, or by taking care in understanding that an offset is in effect. However, this system works, in part, because the time zones are simply offset from each other. A day is still 24 hours long, no matter which time zone you’re in. Noon in Los Angeles is always 3pm in New York City. Similarly, our calendars maintain a certain meaning; for example, when it’s January (if you follow the Gregorian calendar) we know that it’s Winter in the Northern Hemisphere, and Summer in the Southern. But what happens when times are no longer in lockstep? What happens when, as is likely the case with the Twelve Colonies, two people’s days are no longer the same number of hours, and their years are no longer the same number of days? Or, to put a practical spin on this, what happens to your clock when you’re living on Mars, and your days are 24 hours, 39 minutes, and 35 seconds long? What happens to your calendar when your years are 668.6 days long? And, of course, I mean 668.6 Mars days – “sols” – not Earth days…see where confusion could already be sneaking in? 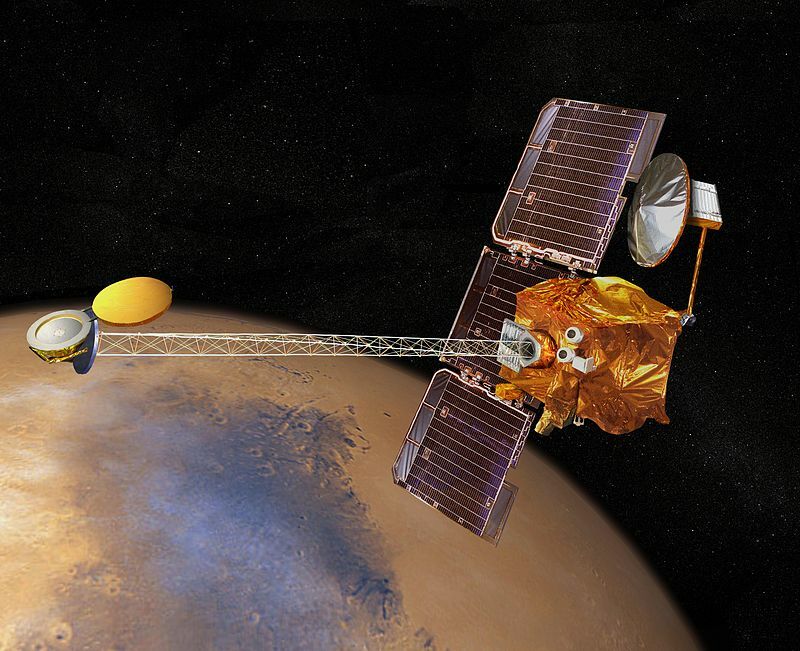 It’s 1130773217 o’clock at Mars Odyssey! Image courtesy NASA. How do we deal with that now? Well, so far, all of our explorers to Mars have been robotic. For the Martian orbiters, rovers, and landers, the method of choice for keeping time is to count the number of seconds that have elapsed since a fixed point in time (midnight of the morning of January 1, 1980 in Greenwich, England is a typical choice). So, while 1130773217 o’clock (approximately the number of seconds since 1980-01-01-00:00:00 UTC when I wrote this down) may not have much meaning to you, a robot can easily run a program that’s scheduled according to this time standard. When the robots communicate with Earth, computer programs on the ground convert these times to a more Earth-based time standard, such as Coordinated Universal Time (UTC) or the local time of the mission control center, in order to make them easier for the mission controllers to understand. But while robots are fine working with a time like 1130773217, it’s not obvious that this particular time corresponds to late morning in Hawaiʻi in mid-Autumn. This is the advantage of the time systems we use: 12:00 reminds us that it’s time for lunch, or December 1 tells us that we should consider wearing something warm if we live in the Northern Hemisphere. But what do these Earth-bound times tell us about conditions on Mars, whose days and years don’t equal ours? Not a whole lot. So, how will the first astronauts to live on Mars keep time? I can’t say for sure, but I imagine they’ll keep some sort of local clock, so that their version of 12:00 still corresponds to lunchtime. I also imagine, rather than keeping a monthly calendar, they’ll simply count sols since landing. Like our robotic missions, computer programs will make the necessary conversions between the two time standards. For astronauts who will spend less than a Martian year on the surface, communicating mostly with a mission control center, this will be a workable compromise. But what about the far future? If humans eventually colonize Mars, how will that affect the keeping of time? The first humans born on Mars may not share the same kinship to Earth as their parents. Rather than tying their time standards to a planet they’ve never visited, perhaps they will choose to set their own standards of time – clocks based on their own sunrises and sunsets, and calendars based on their own passage of seasons. In other words, it’s not unreasonable to think that the emergence of a distinct Martian culture might also bring rise to the establishment of a new time standard not easily compatible with Earth’s. If this happens, how will the cultures of Earth and Mars communicate the time to each other? Will one time standard hold precedence over the other? Or will they choose a third time standard, not based on the motions of either planet, to use for communication? I honestly don’t know the answer, but I do find it a very interesting problem to consider. So long as everybody agrees on the length of a second (or some standard increment of time) and an epoch we can agree on the elapsed time since the epoch. We also need to identify a particular coordinate frame (Earth Centered Inertial? Sun Centered Inertial? Milky Way Galaxy inertial?) that is frame in which time is marching forward and the conversions from that to whatever time is required in a specific calculation, we can do it. Wait a minute, this sounds really complicated. This is actually something that bothers me across multiple science fiction realms. In Farscape, they use different words for measurements of time, but they are so seamlessly equivalent to the human concept that Chriton has no problems adapting to a new vocabulary. On Star Trek DS9, they somewhat touch on the fact that Bajor has 26 hour days, and on the station they use that to schedule crew rotations, etc. yet there’s the assumption that a Bajoran hour is the same as an Earth hour. I don’t have any answers, but it’s an interesting concept to ponder! I guess at some point, using Earth concepts of time helps the viewer. A show could come up with more realistic alien time units, but could confuse the audience at the same time. I’ve never seen the original Battlestar Galactica series, just the newer 2003 reboot, but I understand that original series had its own time vocabulary, like centons and yahren. Again though, like Farscape, these were equivalent to concepts like minutes, hours, and so on. I guess this is a tricky problem because of relativity and other issues, so even in a future cured of the common cold and free from requiring currencies, time can be problematic! Oh man, I hadn’t even considered relativity! For our current technologies, relativistic effects are small (but still significant for precise timing for GPS satellites, for example). If we ever invent the warp drive, that’s going to add a whole new dimension to the problem! That brings up another question…how do you determine the ages of the crew of the Enterprise? Do you measure them in Earth time, or in the dilated time they’ve been experiencing? I’ve been thinking about this too for an RPG universe I’m designing. Considering that time has to be consistent across planets, galaxies and species, the only way I’ve come up with is to track it the same way computers track time: you choose an epoch (birth of the universe, for example, but if relativity causes problems with that it could be something more recent), agree on a standard time unit (for humans it could be a second, but half time of some atom or the time it takes light to travel certain distance might be more universal) and then simply count upwards. You of course need to make up some new time units for day-to-day usage, because the numbers are probably too big, at least for humans. But once you have that kind of standard you could have local time based on local conditions and then use the standard time to convert between local times when necessary. I reckon you’re on the right track. Technically, our time standard is defined by a standard time unit like you describe (in our case, 9192631770 periods of radiation of a Cesium atom), but we chose that to conveniently match a subdivision of our planetary rotation. In the far future, if we have more planets to consider, we might choose something more basic, like basing it on the simpler, more abundant hydrogen atom, or selecting a more round number than 9192631770. Good thoughts! To add another kink into this question, the BSG Twelve Colonies were on 12 planets around four stars in the system. Given that Caprica was the “capital” planet, I would assume that all timekeeping would be Caprica-centric. In the series Caprica, it is demonstrated through dialog that the Capricans were in control of most aspects of Colonial society and politics, so I would imagine that this would apply to time as well. Each planet would have its own time, but they would then be required to do business in Caprica time, just as future Martians would have to do business in Earth time. In a similar fashion, we use GMT on Earth because of the dominance of the British Empire when the standard was defined. That wouldn’t surprise me…you’re right, Caprica was very much the seat of power in the Twelve Colonies. I believe that is one of the possible outcomes…Mars keeping its own time, but having to communicate with Earth in Earth time. Great discussion Andrew! Andrzej- how do you pronounce your first name? When is there going to be a new post? Looking forward to reading more about your time on “Mars” ! Man, it’s been one of those months. Got some ideas and stuff to follow up on, but finding a spare moment to sit down and write has been difficult lately. They keep us busy!